In the Shingon cult I used to belong to, one useful idea, also found in mainstream dharma is, 'food as medicine'. In other words the Middle Way between starving yourself ascetic and sensual over indulgence. Onions and garlic are not forbidden to laity and in particular for colder realms, highly medicinal. Some food flavourings for example some spices and herbs are highly therepeutic. Broccolli and the many brassica/cabbage varieties are a food-medicine, as are fruits and veg in general. Virgin olive oil and tomatoes is one of my current favourite food additions. Any tips for 'food as medicine' you would like to share? "Researchers have long been familiar with the presence of unique polyphenols in plants called lignans, and these health-benefiting substances have been studied extensively in cruciferous vegetables (like broccoli or cabbage) and allium vegetables (like onion or garlic). Recent studies, however, have begun to pay more attention to the lignan content of other vegetables, including cucumbers. Cucumbers are now known to contain lariciresinol, pinoresinol, and secoisolariciresinol—three lignans that have a strong history of research in connection with reduced risk of cardiovascular disease as well as several cancer types, including breast, uterine, ovarian, and prostate cancers. Fresh extracts from cucumbers have recently been show to have both antioxidant and anti-inflammatory properties. While research in this area must still be considered preliminary—since it's only been conducted on animals in a lab setting—the findings are clear and consistent. Substances in fresh cucumber extracts help scavenge free radicals, help improve antioxidant status, inhibit the activity of pro-inflammatory enzymes like cyclo-oxygenase 2 (COX-2), and prevent overproduction of nitric oxide in situations where it could pose health risks. It's highly likely that cucumber phytonutrients play a key role in providing these antioxidant and anti-inflammatory benefits, supporting health alongside of the conventional antioxidant nutrients—including vitamin C, beta-carotene, and manganese—of which cucumbers are an important source. As a member of the Cucurbitaceae family of plants, cucumbers are a rich source of triterpene phytonutrients called cucurbitacins. Cucurbitacins A, B, C, D and E are all contained in fresh cucumber. They have been the subject of active and ongoing research to determine the extent and nature of their anti-cancer properties. Scientists have already determined that several different signaling pathways (for example, the JAK-STAT and MAPK pathways) required for cancer cell development and survival can be blocked by activity of cucurbitacins. We expect to see human studies that confirm the anti-cancer benefits of cucumbers in the everyday diet. " I like to make a fresh tomato and cucumber salad with just your basic Italian dressing on it. Also, roadside fruit vendors here cut them up if you want them, and add them to pieces of melon, pineapple, mango, orange, etc. with lime juice and chili powder. Sage is good but it doesn't really go in ice-cream. It varies so much by person, and a lot of it has to do with historical ancestry and what your great grandparents (and beyond) thrived on. If you hail from a tropical locale, what is ideal to nourish and heal your body will vary a lot compared to someone from the arctic circle. But the overall theme is much the same. Learn how to distinguish between what your brain wants because of attachments to food and experiences/pleasures, and what your body needs for nourishment. When you learn how to do that, what you need will come to you clearly, and it should change with the seasons (and even daily depending on so many factors). Also, there is increasing evidence that what we believe about our food has an effect on what it does to us. If you constantly eat cheesecake and believe it's bad for you, the effects will be worse than if you simply savor and enjoy it and let it go. Quite fascinating. There is a really good article on it buried somewhere in my FB. I will see if I can find it. Overall, the closer to "life" what we eat is, the more healing benefits it has. So much of what we buy has lost a significant portion of it's nutrients, and many are deficient to start because of a lack of good soil. I'd encourage everyone to grow whatever they can manage, even in a window box in a small apartment. You can grow turmeric and ginger root quite easily even, both of which have a ton of healing properties. @silver. Thank you so much for the info. When I can find cukes free of waxed skin I enjoy eating them with the peel on. I try to eat “Mediterranean”. It should be good for me, and it is nice! Argon oil - both int- and ext-ernally. My tip would be to let it reflect the rest of ones daily practice. Your daily practice is a medicine for what? or to aim more on whatever ones personal wants of the moment might be? And ginger! Ginger is an important part of the Chinese pharmacopeia. There are restaurants in China, I hear, where one can take a prescription from the doctor/herbalist, and the cook will create a dish incorporating the foods and herbs the doctor prescribed for the patient's condition. Very cool concept. @silver Thank you for posting about cucumbers! I've always craved them, and eat them every day. Now I know why! lol I'm thrilled to hear they have so many benefits. Of course fresh, proper, healthy food is medicine. The thread title reminds me of a funny (but also sad, and outrageous) story. I got several free passes to a gym once, that was located in the middle of a cluster of medical buildings, so it was mostly docs and nurses using it. There was a bulletin board in the hallway, and someone had posted some kind of healthy diet info there, that was about including lots of fresh veggies and their nutrients and benefits. One of the doctors had left a comment: "FOOD IS NOT MEDICINE" !! (where is the :shock: emoticon?) I couldn't believe it. Apparently the docs there felt that if you were ill, you should take chemicals in the form of pills. and that food was something to be enjoyed heedlessly, like a form of entertainment, or something. Well, being the guerilla grrrl that I am, I couldn't let such ignorance stand uncontested, so I posted an anonymous response to that, supporting the idea that food was, indeed, medicine, a basic foundation to good health. Really, people, the stories I could tell you about doctors could scare you into never darkening their doors again. But happily, we, here, know better, and are on the right track. Kudos to the OP for this wonderful topic! I feel @how makes a good point about ahimsa. Personally I eat meat, fish and eggs, so I am not a good example. Never heard of argan oil, very interesting. @littlestudent is right about overall diet. I too have developed a taste for the mediterranean. Good attitude to food and personal requirements, good points from @karasti. At least try to eat dark chocolate, which is medicinal. Actually I feel it is an essential food yum medicine. Dried Anjeer. I think it is know as fig fruit. Take two or one anjeer dried fruit and keep it in little water at night before sleep. In morning they will ready to eat with a wonderful sweet water. Eat after just brushing your teeth and drink a glass of water. It has many nutritional and medicinal values. After half hour you can eat breakfast. That sounds good, @rohit. My best friend in high school, her mom was Italian and that's where I got my first intro to dried figs - nice and very chewy! I will get some and try your suggestion. I went shopping yesterday and stocked up on carrots n potatoes, apples n cheese, some trail mix with brazil nuts, cucumbers n limes. The potatoes are small, but that's good because there will be more skin and less starch - it's in and near the skin where the potassium is. Since I take a diuretic, I need the extra minerals. Somebody sent me this traditional Tamil chutney recipe. The recipe making starts about two minutes in and includes a quick romantic song in the middle about how men will fall on her feet begging to taste that recipe. Tamarind. The "unknown" ingredient is tamarind. There are anglo-indian chutneys based around crab apples, dates, rhubarb, raisens etc - too much sugar - but for real flavoursome health we have to go to the source. For our USA cousins, pizza and chutney - Yum! I'm on a diet and reading through this post isn't helping much. You are all very naughty! You need to eat more with you pasties. I make salad dressing with virgin olive oil, lemon juice, seasoning and fresh or dried herbs. Eating a salad (which I believe is socially unacceptable in some parts of Northern England, so needs to be done in secret) is best eaten in huge quantities before eating ones traditional fare. This is a mediterranean trick and it really seems to work for us 'Southern Puffs'. Reflecting on my conduct am I worthy of a share? with gratitude I accept this offering today! " @Tosh said: I'm on a diet and reading through this post isn't helping much. Have you tried the ice-cream and lettuce diet? You have to eat one piece of lettuce for every 2 litres of ice-cream. It's not surprising to see asparagus being heralded as an anti-inflammatory food because it provides a truly unique combination of anti-inflammatory nutrients. Among these anti-inflammatory nutrients are asparagus saponins, including asparanin A, sarsasapogenin, protodioscin, and diosgenin. One of these saponins (sarsasapogenin) has been of special interest in relationship to amyotrophic lateral sclerosis (ALS), also known as "Lou Gehrig's Disease." Even though ALS is classified as a chronic, neurodegenerative disease and is not currently accepted as an autoimmune disorder, excessive, unwanted inflammation may play an important role in the death of certain nerve cells (motor neurons) in ALS. Other anti-inflammatory nutrients in asparagus include the flavonoids quercetin, rutin, kaempferol and isorhamnetin. Alongside of these anti-inflammatory phytonutrients, asparagus provides a wide variety of antioxidant nutrients, including vitamin C, beta-carotene, vitamin E, and the minerals zinc, manganese, and selenium. In addition to the antioxidant nutrients above, this much-loved vegetable may also contain a valuable amount of the antioxidant glutathione (GSH). GSH is one of the body's best-studied antioxidants; it consists of three amino acids — glutamic acid, glycine, and cysteine — combined into one molecule. At least one published study has estimated the amount of GSH in fresh asparagus to average 28 milligrams per 3.5 ounces. Several studies have compared the overall antioxidant capacity of asparagus to the antioxidant capacity of other vegetables, and the results for asparagus have been impressive. Asparagus compares favorably with many of the cruciferous vegetables like cabbage and cauliflower, and while it ranks lower than some of the green leafy vegetables like spinach, it is still very high on the list of antioxidant foods. Anti-inflammatory and antioxidant nutrients are some of the best risk reducers we know for common chronic health problems including type 2 diabetes and heart disease. These nutrients are also special risk reducers in the case of certain cancer — a special area of asparagus health benefits that is covered in the following section. As described earlier in our "What's New and Beneficial about Asparagus" section, asparagus is unusual as a digestive support food. One key factor in this regard is its inulin content. Like chicory root and Jerusalem artichoke, asparagus contains significant amounts of the nutrient inulin. Inulin is a unique type of carbohydrate called a polyfructan, and in practical terms, healthcare practitioners often refer to it as a "prebiotic." Unlike most other carbs, inulin doesn't get broken down in the first segments of our digestive tract. It passes undigested all the way to our large intestine. Once it arrives at our large intestine, it becomes an ideal food source for certain types of bacteria (like Bifidobacteria and Lactobacilli) that are associated with better nutrient absorption, lower risk of allergy, and lower risk of colon cancer. While approximately 5% lower in inulin than chicory root and Jerusalem artichoke, asparagus is a food that contains a valuable amount of this unique carb and can help support our digestive health in this unique way. Alongside of its unusual inulin content, asparagus is rich in fiber (about 3 grams per cup, including about 2 grams of insoluble fiber and 1 gram of soluble fiber) and also contains a noteworthy amount of protein (about 4-5 grams per cup). Both fiber and protein help stabilize our digestion and keep food moving through us at the desirable rate. (By contrast, too much fat can slow down our digestion rate more than desired, and too much sugar or simple starch can speed it up more than desired. We're not surprised to see species of asparagus like Asparagus racemosus (commonly known as Shatavari) having a long history of use in treatment of digestive problems in certain healthcare traditions (like ayurvedic medicine), and it makes sense to us that asparagus be considered as a great food for improving digestive support in most diets. As a result of its very strong anti-inflammatory and antioxidant nutrient composition, we would definitely expect to see a food like asparagus showing up as a risk reducer for certain cancers. Chronic, excessive inflammation and chronic oxidative stress are risk factors for a variety of cancer types, and both unwanted phenomena are related to deficient dietary intake of anti-inflammatory and antioxidant nutrients—exactly the kind of nutrients that are especially plentiful in asparagus. Most of the studies we've seen on the anti-cancer benefits of asparagus have been studies on rats and mice, or studies on specific types of cancer cells. For this reason, we would describe asparagus cancer research as preliminary, and not yet validated by large-scale studies involving humans and dietary intake. But the trends in animal studies and cell studies are clear - asparagus and asparagus extracts can change the metabolic activity of cancer cell types, and these changes are protective in nature and related to better regulation of inflammation and oxidative stress. Cancer cells from the liver are best-studied in this regard. One confusing area of research on asparagus and cancer involves leukemia. And while this arena has focused upon enzymes related to an amino acid in asparagus, rather than asparagus itself, we thought to include information on it here to clarify this arena for you in case you had come across information on this topic. Leukemia is a type of cancer involving the bone marrow and its production of white blood cells. In leukemia, white blood cells are not produced in a normal way and do not behave in a normal way, and for these reasons are called leukemia cells. One unusual aspect of leukemia cells is their need to obtain a specific amino acid called asparagine from other cells or from the fluid portion of the blood. If leukemia cells can be prevented from obtaining asparagine, they can sometimes have difficulty surviving. In the mid-1950's and 1960's, researchers discovered that the injection of an enzyme called asparaginase into persons diagnosed with leukemia could sometimes result in decreased levels of blood asparagine in the blood and selective destruction of leukemia cells through asparagine deprivation. Prescription injection of asparaginase enzymes is still used in treatment of acute lymphoblastic leukemia (ALL). Asparagus has become entangled in this fascinating set of events involving leukemia because the name of the amino acid "asparagine" and the name of the enzyme "asparaginase" clearly imply a connection with asparagus. Both the amino acid and the enzyme are present in asparagus, just as their names imply. However, we are not aware of any research showing a treatment connection between leukemia and dietary intake of asparagus. The only research we've seen involves injection of the purified, prescription enzyme medication. In addition, we know that pharmaceutical companies do not use asparagus as a source of the asparaginase enzyme, but rather, rely on bacteria as their enzyme production source. " Asparagus = yum. Thanks for info. I am a great believer in fat, so check out coconut oil and olive oil for flavouring your asparagus. Plenty of vegetables, brown basmati rice, and as much brown everything as I can. -Green tea: especially matcha, bucketfuls every day. -Turmeric: I carry my own turmeric when we eat out. Best single ingredient for health there is. -Lemon: the whole family drinks water laced with lemon ridges. My pantry can be low on other things but NEVER, and I mean never, without these fellows. Great post about asparagus, Silver! Are there any differences between green and white asparagus? Hi @littlestudent, the article seems to be about the green variety - I forgot there was even a white type. asparagus is one of my very favorite things. It grows wild here, and is easy to find and pick. Mostly from people's gardens that let it get away, lol. Hard to start, but goes like wildfire once it gets going, lol. I love it with poached eggs for breakfast. And slightly roasted and put in salad. And just raw. I have found that if you can find it, using actual turmeric root really adds depth to things (and then you don't get the sandy/dry texture as much. I love to have turmeric/ginger tea and it's sooo good with fresh turmeric! Very hard to get where I live though. I was utterly shocked to find it. It was $7 for a pint container. Worth every cent. Looking forward to making curry with it in the next few days! Today, I had a date day with my 13 year old. We saw a movie and ate out and did some shopping. Unfortunately, he chose McD as our food place. I ate a kids meal, lol. It's amazing how that kind of food gives you so many calories and yet you come away feeling so unnourished. Hate that. There is such a difference between garbage food and nourishing food (of course, what that is varies for everyone). You're very lucky to have it grow wild - I had no idea, @karasti that it would do that. You should see the high prices of asparagus here sometimes. It chagrins me too that you can buy a fast food meal and feel unsatisfied. Something I don't normally do. I think I may be B12 deficient. I have all the symptoms, almost all of them, which may apply to a rapid heart beat as well. My friend and I were talking the other night about cravings and their possible (probable) connection with nutritional deficiencies and they really do seem to fit. So, I went out and talked to a pharmacist and decided to get stocked up on some B12 tabs. Asparagus growing wild? You live in heaven/the purelands! Here the spring nettles are starting to grow. If you go out and collect a big, big, BIG bag of the green tops, you will need to wear gloves. Then place oil or little water in your biggest pot and reduce them to a spinach - that kills the sting. Add seasoning. •We've become accustomed to thinking about vegetables as great sources of phytonutrients. Indeed they are! But we don't always appreciate how unique each vegetable can be in terms of its phytonutrient content. Recent research has shown that chard leaves contain at least 13 different polyphenol antioxidants, including kaempferol, the cardioprotective flavonoid that's also found in broccoli, kale, strawberries, and other foods. But alongside of kaempferol, one of the primary flavonoids found in the leaves of chard is a flavonoid called syringic acid. Syringic acid has received special attention in recent research due to its blood sugar regulating properties. This flavonoid has been shown to inhibit activity of an enzyme called alpha-glucosidase. When this enzyme gets inhibited, fewer carbs are broken down into simple sugars and blood sugar is able to stay more steady. It makes sense to think about chard as a vegetable whose flavonoid phytonutrients are unique and may offer special benefits for blood sugar control. •Like beets, chard is a unique source of phytonutrients called betalains. In the betalain family are found reddish-purple betacyanin pigments as well as yellowish betaxanthin pigments. Both types can be found in chard! In the reddish-purple stems of chard and the reddish-purple veins in the leaves, scientists have identified at least 9 betacyanin pigments, including betanin, isobetanin, betanidin, and isobetanidin. In the yellowish stems and veins, at least 19 betaxanthin pigments have been identified, including histamine-betaxanthin, alanine-betaxanthin, tyramine-betaxanthin, and 3-methoxytyramine-betaxanthin. Many of the betalain pigments in chard have been shown to provide antioxidant, anti-inflammatory, and detoxification support. The detox support provided by betalains includes support of some especially important Phase 2 detox steps involving glutathione. So you can see that in the case of chard, beauty is far from just skin deep! 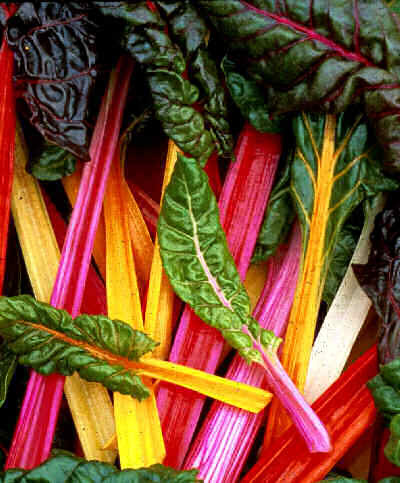 Oh chard is wonderful, easy to grow and if you get rainbow chard, SO pretty in the garden! Can you give me a short tutorial on how you cook it, @karasti? I do like bok choy, too. Spinach not so much. chard can be cut into sections and steamed, or thrown into a frying pan with a little olive oil & butter mixed, cooked until wilted, then topped with grated parmesan, and a light sprinkling of fresh lemon juice.... My mouth is watering.....! Usually in a frying pan as Fed mentioned. I usually put some garlic and sometimes some heat (usually red pepper flakes) on it. They are good in almost any type of saute, just for a couple minutes, until the leaves wilt. I would think without googling, the green is more beneficial. All asparagus is green as far as I know. White is produced by covering the growing stalks so they do not receive light. @silver yes, vitamin K. Usually it can be adjusted to account for an increase in veggies, if needed. White and green asparagus are quite similar in nutrition content (I did google, because I am always curious about this stuff, lol) Purple as well. Green is slightly better. Also reproduced in this thread. 1 pack of thin vermicelli rice noodles. Soak the noodles in cold water, for 5 minutes, until soft. take enough noodles to form a small nest (around a mouthful) and gently lay in the pan. Remove any excess oil from the pan, then fry the bacon shreds until really crisp. Remove, drain on kitchen paper. (this part is optional). Then, begin to fry the onions, garlic and ginger. Add the julienned carrot. Continue frying until this has softened. add stock, soy sauce and lime juice. Continue cooking and stirring until everything is softened and cooked, and the liquid has been absorbed/evaporated. Cut the tofu into flat slabs, around 1/2cm thick. Coat each slab with seasoned cornflour (maize flour). I season it with garlic salt and a little pinch of chilli powder. fry on all sides in some vegetable/sesame oil, until golden. Cut each slab in pieces (size as desired). The tofu can also be served with a sweet chilli sauce, mixed with a little soy sauce and plum sauce. Plain rice is good with it, too. ^^^ Does reading recipes count as nutrition? [salivating cructacean] I think it was a French nutritionist Descartes who stated: 'I eat therefore I yam'. I grew up catholic and have learned to use Lent as a purgeing and dietary straightening out period. For me The South Beach Diet works good. I start with a 24 hr fast then move into the Phase I part of the diet for two weeks. No carbs no sugar not even beets or carrots. No caffiene no artificial sweetners. No alcohol or tobacco. Plenty of good water and green tea. After two weeks I slowly reintroduce carbs. Sweet potatoes, whole grain bread and brown rice. The results. are very good. @ExNihilo Veggies and even meat have carbs in them. Very low carb, yes. But not no carb. Even kale and eggs have carbs. And more's the point - why?